Boris Artzybasheff [ahrt-si-bah-shif] (1899 – 1965) was an American illustrator known for his strongly worked and often surreal designs. Artzybasheff was born in Ukraine, son of the author Mikhail Artsybashev. He is said to have fought as a White Russian (royalist). During his lifetime, however, Artzybasheff was probably known best for his magazine art. He illustrated the major American magazines ‘Life,’ ‘Fortune,’ and ‘Time’ (including more than 200 ‘Time Magazine covers between 1941 and 1965) During World War II, he also served an expert adviser to the U.S. Department of State, Psychological Warfare Branch. After 1940, he devoted himself to commercial art, including advertisements for Xerox, Shell Oil, Pan Am, Scotch Tape, and Parker Pens. His graphic style is striking. 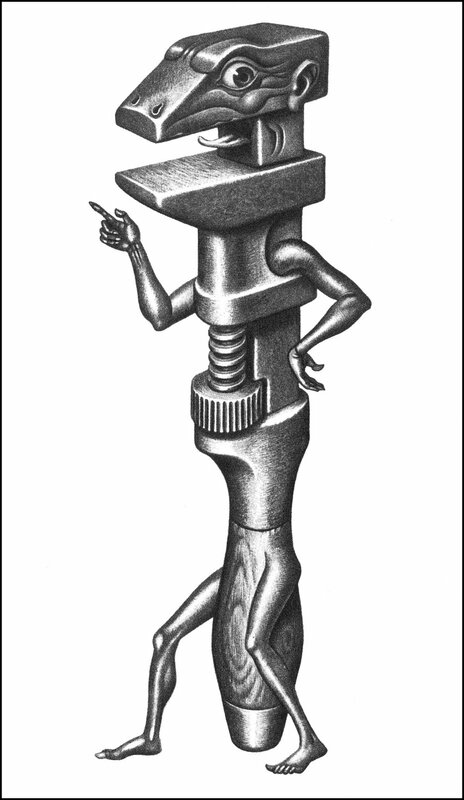 In commercial work he explored grotesque experiments in anthropomorphism, where toiling machines displayed distinctly human attributes. Conversely, one of his works shows Buckminster Fuller’s head in the form of Fuller’s geodesic structure. In his personal work, he explored the depiction of vivid and extreme ranges of human psychology and emotion.